Margarita Pérez was eleven years old when her mother moved her and her two sisters from Veracruz, Mexico to the United States. In this interview excerpt, she recalls the harrowing experience of being separated from her mother following a perilous desert crossing into the United States. Selection from interview with Margarita Pérez by Marina López, 28 May 2012, courtesy of The Citadel Oral History Program, Lowcountry Digital Library. Clip from original interview minutes 13:20-21:11. To access the full oral history and transcript, click here. 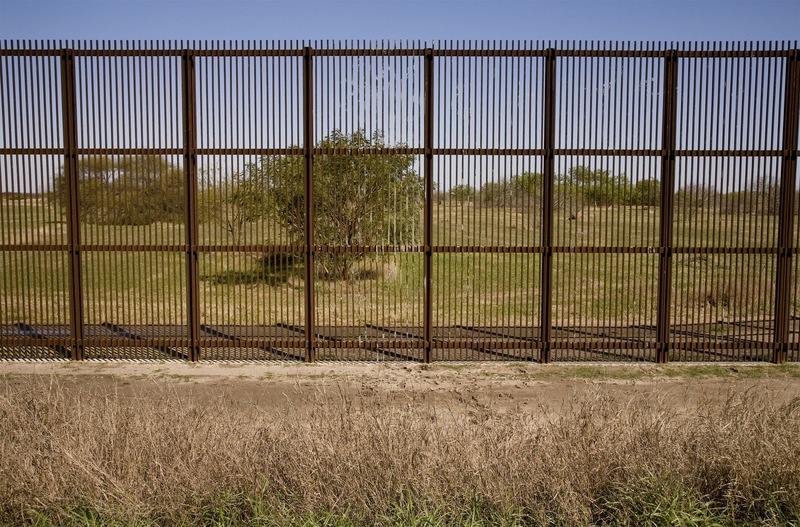 Border wall between Mexico and the United States, photograph by Susan Harbage Page, near Brownsville, Texas, 2010. Marina López: How did you find out that you were moving here? Margarita Pérez: I remember that my mother told me that we were moving here. I was at my grandmother’s house in the hallway. We were there and my mom told me the same day. My mom is that type of person who does not share things a month or two in advance. No, she is like, if she thinks about it today, today she does it. That same day she told that she was leaving for the United States, but that she was not going to take me or my sisters with her. She was not going to take us with her, and I remember that I started to cry, and I asked her not to leave me. I did not want to stay behind. I wanted to go with her, and I remember that we cried together, and she decided to take us with her. Sometimes I think that she would have left us if I did not pressure her to take us with her. ML: You found out that you were coming over, and then how long did it take until you started the trip? MP: That same day. That same day in which my mother told us about it. It was like my mother told us around six in the evening and a short time after, around ten she left that same day. My mother told me that same day that she was leaving, that she was leaving. She did not wait for anybody to tell her anything. ML: Did you start to travel that same day? MP: Yes that same day, she had everything ready. Our luggage was ready. ML: How was the trip? MP: I remember when we left. We took a taxi from my grandmother’s house to the ferry boat. There is a boat to cross to Coatza and from Coatza we took a bus to go—I don’t even remember where, but it was to cross there. I think it was Mexico City, but I am not sure. ML: How did you all cross over? MP: We crossed over through the desert. ML: Somebody helped you cross over? MP: Yes, somebody helped us to cross over. We were a total of fifteen people, and my mother, I, and my sisters were the only women in the group. MP: We walked for a day and a half and I remember that my mother, Omar, my mother’s boyfriend, and my two sisters were lost. In the middle of the desert they were lost, and I was left alone with all the men—the guys, the men. I was left alone with all of them. And I remember that the guy told me, the guide, the one that helped us to cross over, he told me that they were making fun of the fact that my mother and sisters were lost. ML: Your mother and sisters were lost, you were left alone with those people, and they were making fun of you? ML: What a scare, Magui. ML: Yes, of course—of course it is not something you tell an eleven-year-old child. ML: How did the trip end up—it was the first time that you did such a trip being only eleven years old? This was the first time that you went through something like this? MP: Yes, we crossed at the first opportunity. We did not get caught by Immigration or anything. At the first opportunity we crossed over. ML: Do you have any idea of where you arrived, Magui? MP: I remember that we got there during noon of the second day that we were walking. We arrived at what looked like a small Indian city. I think that’s how they call it here in the US. By that point we already crossed over. I remember that a man gave us macaroni and cheese for lunch, and I remember that it was the first time in my life that I had tried that food. He gave us that. After that my mother told us, my sisters and I, that we were going to travel in a car to some lady’s house. They, and all the other people that came with us, were going to stay one more night in the desert and cross the next day. They did not want us to stay in the desert because it was too cold at night. It is very cold at night in the desert. They took us in a car to some lady’s house. She had a daughter. We stayed with her. We did not have any news of my mom until three days later or something like that. Then the guide did not want to bring us back to our mother because while we were at the lady’s house, my mother told me that when they were going to cross everybody got robbed by people that were helping them to cross over. They took my mother, Omar, and other people. Some were able to run away and were not caught, but others were caught and they demanded money from them to let them go. It was not Immigration who caught them. It was our own people, Hispanics, the people helping us to cross over. They were asking for more money in order to let them go instead of letting them cross over. Once on this side they were caught. It’s complicated to explain. Those who were able to cross over were sort of kidnapped by the people who initially helped them cross over. My mother and others were kidnapped and asked for a ransom in order to let them go. I remember that my mother told me that she told the guide that she needed to go because she had three daughters who already crossed over, but they were refusing to give them back to her until she paid. I remember that they charged one thousand dollars for each daughter. She was able to find the money and pay the guide. Then they gave us back to our mother. ML: Do you have any idea of how your mother was able to get the money? MP: I don’t know. I think some of the money came from Omar’s family, my mother’s boyfriend. They wanted the money in dollars. It is a lot of money to send dollars from Mexico. ML: Do you remember how you spent those three days? You were eleven years old. It is the first time that you were separated from your mother and all of a sudden you are with strange people. Do you remember how you felt or thought during that time? ML: What did your sisters do during that time? MP: I suppose that they cried too. I do not know, I was just worried about my mother and I did not give too much attention to what my sisters were feeling at the time. ML: When you finally united with your mother, did you have any idea of which city you were in? MP: When we finally were together, I remember that we left to live in Arizona. I remember that it was in Arizona, with a lady that lived there. She came to the US a long time before. She gave us a place to stay for some time, and then we left with my mother.